Angku... literally means Red Tortoise cakes (translated from Hokkien). It has a been a tradition or a culture among Chinese families... to celebrate the baby's reaching his/her 1st month... the parents will prepare (nowadays ~ just order) and celebrate with other members of their extended families, friends and neighbours... everyone get to feast on yellow glutinous rice served with Chicken Curry, Red hard boiled eggs, and Angku. Prepare steamer and steam the split green beans with pandan leaves for at least 30 minutes until it is soft. Discard leaves. Combine split beans with sugar and oil in wok and stir on medium high fire. Stir continuosly until sugar and beans becomes thick and binds and not stick to your hands. Roll into a ball and put aside. extra oil for later use. Add food colouring to water. 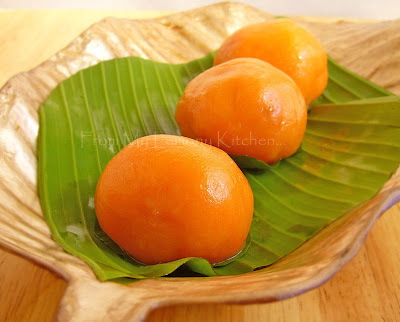 Combine the mashed sweet potatoes to glutinous rice flour. Knead. Add water bit by bit until smooth dough is achieved. Take a bit of the dough..may be slightly bigger than the size of the rolled up split green beans above... Flatten into a disc on your palm... add the green beans ball ... wrap the ball with the dough. Making sure that the split beans ball is fully enclosed. Roll gently to smoothen. 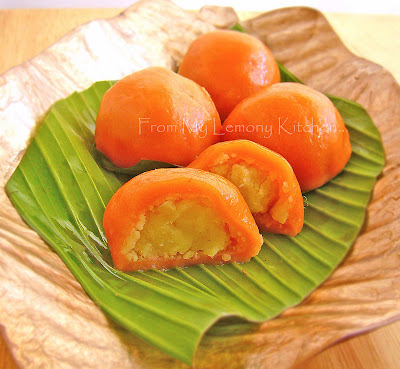 I love love the color of your angku kueh. They are just so beautiful. I love the leftover of this and pan fried it on a non-stick pan with a bit of oil until crispy on both side. Yummy!